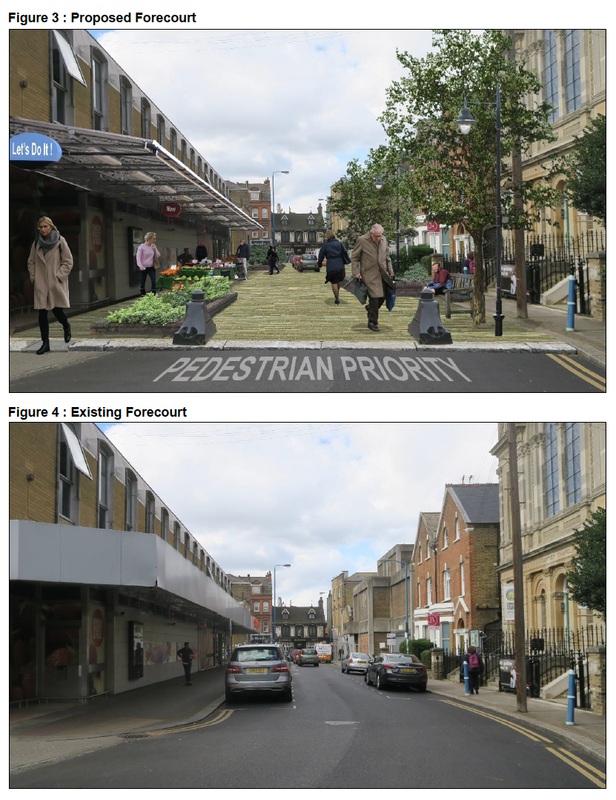 The proposal is for discussion as an example of what could be done to improve the pedestrian and general environment of a busy area in Putney Town Centre. It accords with council policies to enhance the role of town centres and to promote active travel. Sainsbury’s supermarket is located on Werter Road in Putney. At street level its frontage comprises opaque panels often adorned by sales offers. A ponderous canopy provides weather protection to pedestrians on the southern side of the road. Directly in front of the supermarket 9 parking bays occupy more than half of the road width, two of which are reserved for disabled drivers. Cycle parking stands are located close to the supermarket entrance and constrict the movement of people entering or leaving the premises, or merely passing by. Owing to the lack lustre character of the supermarket, together with the clutter or parked vehicles and cycles, the visual quality is shabby. See Figure 1. An additional negative aspect is the high volume traffic using Werter Road. The road is one way westbound and is lined with vehicles parked on both sides for most of its length. Traffic comprises visitors to Sainsbury’s, residents and drivers wishing to gain access to Putney High Street. The latter accounts for a significant proportion of the vehicles due traffic management arrangements, as can be seen by the vehicle shown in Figure 1. No right turn at the High Street junction obliges westbound traffic on Upper Richmond Road to turn right into Oxford Road. Some of this gains access to the High Street via Disreali or Putney Bridge Roads (see route marked in blue on Figure 2) whilst a significant proportion uses Werter Road as a rat run (see route marked in red on Figure 2). Similarly, no left turn at the junction of Putney Bridge Road and the High Street obliges vehicles wishing to travel south west to turn into Oxford Road as shown by the line in black. Some vehicles continue to the junction with Upper Richmond Road, to make an awkward right turn, whereas most prefer the left turn into the High Street by using Werter Road. Despite the recent introduction of a 20 mph limit vehicles often speed the length of Werter Road, a tendency recognised by the presence of signs attached to lamp posts informing drivers to watch their speed. the carriageway narrows, and is further restricted by vehicles parked on both sides of the road, and pedestrian volumes are high. designate the area outside the Sainsbury façade as a pedestrian priority zone through which traffic is permitted to pass with due care and attention. Replacement of the existing road surface with a durable pavement material that extends for the full width of the road, including the sidewalk adjacent to Sainsbury’s, from the exit of the basement car park to the High Street. Raised plant beds, trees and other green features as well as seating and ornamental lamp stands. Cancellation of all street parking spaces within the pedestrian zone. Putney Town Centre is notably short of civic space. The proposal provides an opportunity to address this omission by creating a more friendly environment in an area with high pedestrian flows. The Baptist Chapel (Community Church) is directly opposite to Sainsbury’s and has become a meeting place for the congregation as well as local groups. As such the proposal is well located as a civic space, albeit on a shared basis with vehicles. The enhanced amenity of the proposal is in line with the policy to promote active travel within London. It should be noted that this branch of Sainsbury’s is not a mega-store that depends on clients arriving by vehicle. Rather, it is a local facility that serves residents, most of whom are pedestrians. The potential hazard that results from vehicles parked at this location is negated. The two disabled parking bays could be relocated to the basement car park. A lift from the basement to the store ensures easy access the physically impaired. In addition, two spaces can be allocated on Werter Road (outside house number 8) by removal of the traffic island. Similarly, a delivery parking bay for the Church can be reserved outside house number 9. Their heavy canopy should be replaced with a more elegant structure. This could be done in isolation or as part of an overall renovation that might include additional accommodation on upper floors. The street level façade could be made more interesting by the display of products in the form of a typical shop window, or the sale of fresh vegetables from a stall. Delivery to the store will continue to operate in the same way, although it would be beneficial if smaller vehicles were employed. The existing arrangement involves heavy vehicles backing into the delivery bay, a procedure done despite a large number of pedestrian in the immediate vicinity. It is not envisaged that any additional danger will be incurred within a pedestrian priority zone. • A pedestrian priority zone immediately in front of the Baptist Chapel will assist the building to fulfil its community functions. Deliveries may take place by allowing vehicles to temporarily park within the pedestrian zone. – Signs need to installed at the eastern end of Werter Road informing that entry is access only. – Road markings at the threshold of the pedestrian zone road should make it clear to drivers that pedestrians have priority. Placement of bollards at the entrance to the zone will assist. – The existing taxi rank can remain in its present location. – Werter Road should made two way for cyclists by the simple expedient of a signs at either end of the road. Despite an “Access Only” sign there is concern that traffic flow on Werter Road will continue at a similar level. Should this be case the inherent hazard in the section outside Sainsbury’s will be no greater than it is today, indeed it could be reasoned that the priority given to pedestrians will ensure that drivers take more care. Also, removal of parking bays will greatly improve sight lines. 1. Closing the pedestrian zone to all vehicles. Through traffic would be required to take alternative routes as shown in Figure 2 (and suggested below). 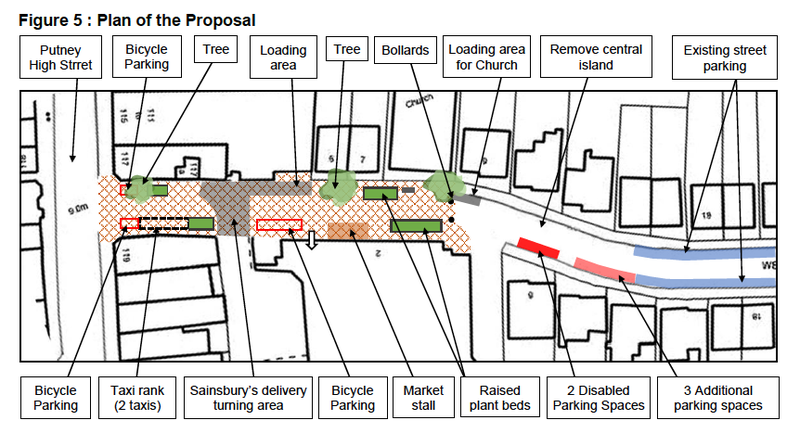 Vehicle access to Sainsbury’s and residents’ premises would continue by making Werter Road two way. 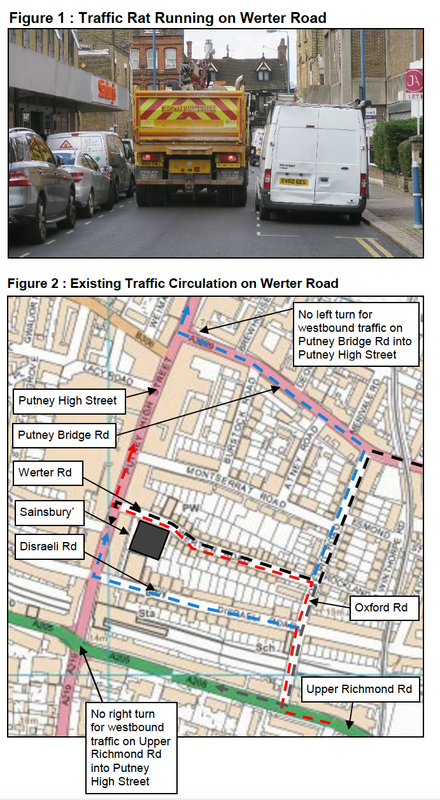 Deliveries to Sainsbury’s would be made from via Putney High Street by permitting a right turn into Werter Road. Placement of street furniture and landscaping will need to ensure that delivery vehicles can reverse into the loading bay. Reversing would be easier if Sainsbury’s employed smaller delivery vehicles. Alternatively, another solution would be to retain the existing delivery movement by permitting delivery vehicles to pass through the pedestrian zone (east to west) on the understand that they alone are allowed to enter the zone. The only exemptions would include taxis (to gain access to the rank) or deliveries to premises fronting the pedestrian zone. 2. Modifications to the present traffic management arrangements such that westbound traffic on Upper Richmond Road is allowed to turn right into the High Street. This could be achieved by replacing the present traffic signals with a roundabout. There is sufficient space to accommodate an appropriate junction design. A similar modification could be introduced by permitting westbound traffic on Putney Bridge Road to turn left into the High Street. Sufficient space exists to adapt the present layout to accommodate a filter left. Either or both modifications will negate the obligation for traffic to use Oxford Road and hence reduce the flow on Werter Road. 3. Montserrat Road has a relatively low vehicle flow because it is one way eastbound, with a time restriction for right turns into the road from the High Street. By making this road two way a proportion of the through traffic that uses Werter Road to access the High Street would divert to Montserrat Road. These three options are not mutually exclusive and could be implemented independently or in conjunction with one another. It is understood that Wandsworth Borough Council are concerned to improve the amenity of Putney Town Centre and address the issue of traffic congestion and associated poor air quality. To this end a consultant has been appointed to study options. It is hoped that this proposal will be given careful consideration and form part of the consultation’s recommendations.